to discuss your requirement and we will give you a free estimate or email us on info@jaybeeelectrical.co.uk. John Bundfuss began Jay Bee Electrical in 1993 and since then, we have been providing electrician services to the local South London and Surrey region. All our electricians are professionally qualified and have at least 7 years experience in fixing electrical problems. We take pride in our customer service and are always prompt, reliable and have a strong customer focus. No job is too big or too small. Jay Bee Electrical are a leading electrician firm based in the South London and Surrey area. For any electrical services from installing an extra plug socket through to a complete re-wiring of your property, we will solve all your problems in a quick, friendly and professional manner. Jay Bee Electrical are Elecsa members and formally recognised and approved as a Part P registered electrician by the Government. 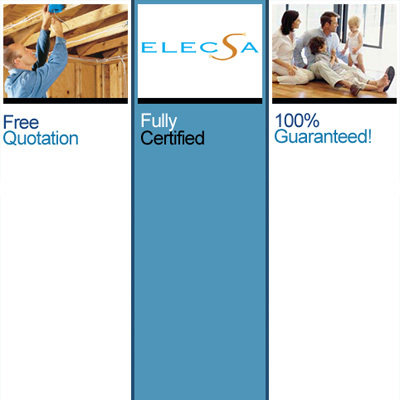 Therefore we are able to self-certify all the electrical work that we do in all dwellings. This professional qualification means that you can be sure that our work is completed to all safety standards and we will inform the local authority about any changes that have been made to your property. Read more about the planning rules for electrical safety. Our customers include landlords, estate agents, home owners and building contractors. We provide a professional service to all our customers and all our work is 100% guaranteed.